You put on your fancy new fringed dress to match your “marcelled” hair that you spent hours perfecting. You walk down your fancy marble staircase to meet your husband dressed in coat-tails and a bow tie and take his arm. You arrive in the Grand Ballroom where your colorful guests are dancing the Charleston and sipping on Champagne and cocktails. A 12-piece band is playing in the background and a group of men are corrugated in the corner smoking cigars and discussing the New York railroad business. The women are eyeing each others outfits and gossiping about the latest news of each of America’s wealthiest families. Newport, Rhode Island was the summer home of America’s most wealthiest families during the Gilded Age into the Roaring 20s. They built mega mansions on the seaside cliffs and held glamorous parties that would be raved about until the next one the following weekend. Today, the halls of the over-the-top mansions sit in silent as the families and their homes no longer host elaborate parties for the rich and famous. However, tourists are welcomed to tour the mansions through the Preservation Society of Newport Count. The Preservation Society of Newport County has been protecting, preserving and presenting the story of some of America’s most infamous summer “cottages” for over 69 years. The Preservation Society owns and maintains 11 historic properties, which date from 1748 to 1902 and hold a combined value of $1 billion. The Preservation Society offers different levels of memberships to help support and preserve the historic homes of Newport. Of course, if you don’t want to support and preserve some amazing homes, you can always take one of the mansion tours, which is absolutely worth it! Jane and I opted for the “Newport Mansions Experience,” where we had the option to tour 5 different mansions of our choice for $31.50. There are several different options for you to choose from depending on how much time you have and how much you’re willing to spend. However, I highly recommend the 5 mansion tour! As you walk into each mansion, you are handed an audio handset that will walk you through each mansion. Audio tours come in several different languages and are very high quality. Again, depending on time and what catches your fancy, you can just do the simple tour or listen to the many extra stories and tidbits. Each audio tour was full of information and I loved the personal stories from old family members and employees of the properties. 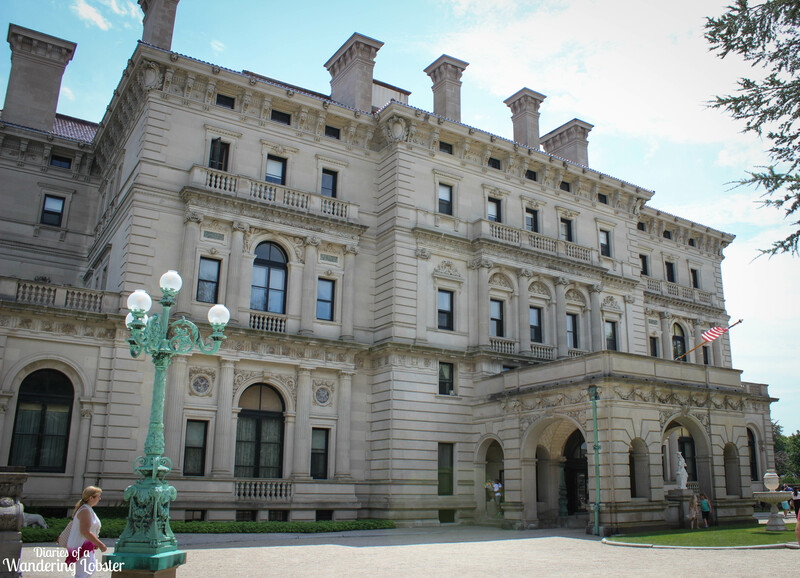 The first stop on our tour was The Breakers, the grandest of the summer cottages of Newport. The Breakers was built in 1895 for Cornelius Vanderbilt II. Cornelius Vanderbilt II is the grandson of Commodore Cornelius Vanderbilt, who established the Vanderbilt’s fortune in steamships and the New York Central Railroad. Cornelius II purchased The Breakers with a small wooden house in 1885. The house burned down in 1893 so Cornelius II commissioned the current day 70-room summer estate to be built. The mansion was built in the Italian Renaissance-style palazzo inspired by the 16th century palaces of Genoa and Turin. In 1934, Gladys Vanderbilt inherited the home from her mother. Gladys opened The Breakers to the public in 1948 to help raise funds for the Preservation Society. In 1972, the Preservation Society purchased the home from her family and is one of the main attractions in Newport today. Our second stop of the day was Rosecliff. Rosecliff was commissioned for $2.5 million in 1899 by Nevada silver heiress Theresa Fair Oelrich. The home was modeled after the garden retreat of Versailles. Tessie, as she was known in her society circle, hosted many glamorous parties at her home after in was completed in 1902. Mr. and Mrs. Edgar Monroe of New Orleans purchased the home in 1947. Mr. Monroe and his wife continued the tradition of throwing lavish parties, many of which were Mardi Gras themed! In 1971, The Monroe’s donated Rosecliff and all its contents to the Preservation Society along with a $2 million operating endowment. Scenes from the 1974 version of The Great Gatsby with Robert Redford was filmed at Rosecliff. Jane and I walked about a quarter of a mile down the street to the Marble House next. After touring each mansion I would think that mansion was my favorite until I finished with the next one. The Marble House began construction in 1888 and was finished in 1892 for Mr. and Mrs. William K. Vanderbilt. The Marble House was one of the first “mega-mansions” built in Newport that set the stage for other Newport mansions that were being built in the late 1890s and early 1900s. William K. Vanderbilt was the grandson of Commodore Cornelius Vanderbilt and his oldest brother, Cornelius II, built The Breakers. The Marble House was inspired by the Petit Trianon at Versailles. The cottage cost over $11 million to build, with about $7 million of that being spent on 500,000 cubic feet of marble. William and his wife, Ava, divorced in 1895. She remarried and moved down the street. After her new husband’s death, she reopened the Marble House and built a Chinese Teahouse in the backyard. Ava often hosted rallies for women’s right to vote in the teahouse. The Preservation Society acquired the mansion in 1963. Jane and I ran out of time on Saturday to tour more mansions. Luckily our tickets have no expiration date thus we decided to go back on Sunday to finish our last two tours. We began our 4th tour early Sunday morning at my favorite mansion, The Elms. The Elms was the summer cottage of Edward and Herminie Berwind of Philadelphia and New York. Mr. Berwind made his fortune in the Pennsylvania coal industry. In 1898, the Berwinds commissioned The Elms to be modeled after the French château d’Asnieres located outside of Paris. The cottage cost a total of $1.4 million and was completed in 1901. Herminie died in 1922. Mr. Berwind invited his sister, Julia, to be the hostess at The Elms. She hosted parties at The Elms until her death in 1961. The house and its contents went up for action shortly after that. The Preservation Society raised money to purchased the home before it became a parking lot, like many of the other homes nearby. The Elms was by far my favorite out of the 5 mansions we toured over the weekend. The Elms was ornate, but not to the extremes like The Breakers. Each room contains beautiful craftsmanship, whether it was hand carved woodwork or colorful murals painted on the ceilings. I LOVED, LOVED this house and I can’t believe it almost became a parking lot. The Preservation Society also offers the “servant life tour” at The Elms for $15. Jane and I did not do this, but I absolutely want to go back and do it. My Downton Abbey dreams will come true! The last house on our tour was the Green Animals Topiary Garden house located a short drive away in Portsmouth. The Green Animal house is not like the stone mega-mansions of Bellevue Avenue. Green Animals is a modest farmhouse with an absolutely beautiful and unique gardens. The garden contains dozens of shaped animals surrounded by award-winning flowers. You can read more about my experience at the Green Animals Topiary Garden house HERE. Touring the mansions of Newport, Rhode Island is a very touristy activity; however, I thing it is worth waiting in line and dealing with large crowds. Interior photography of the mansions is prohibited, hence why you don’t see any photos of the inside of the mansions, so I highly recommend touring the mansions if you ever find yourself in Newport. I love the 1920s and these “summer cottages” allowed me to picture myself as a guest of the wild and elegant parties hosted by some of America’s richest families. I’m counting down the days until I can go back and explore the other mansions on Bellevue Avenue. Have you ever done the Newport Mansions Tour? Which one is your favorite? Which one is totally over the top?